Sounds like Oscar gold doesn’t it? 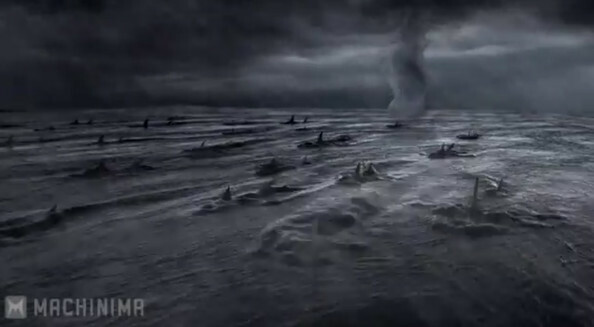 Well, like it or not, the world is abuzz over Syfy’s newest hit Sharknado. Yes, the geniuses who brought you Ice Twisters, Piranhaconda, and Sharktopus have done it again. It’s all anyone who saw it is talking about today and for those who haven’t, Syfy is re-airing it this Thursday, July 18th at 7pm. If you haven’t seen it yet, here’s the trailer. into a post for this blog? The movie obviously isn’t big on scientific realities. Well I thought a bit about it, and it hit me, tornadoes in hurricanes! For those not familiar with hurricanes, throwing one natural disaster inside another sounds like a Syfy movie, but it’s all too true. About half of the hurricanes that make landfall will also spawn at least one tornado. The highest number I could find from one storm is Hurricane Ivan in 2004. That storm spawned 127! 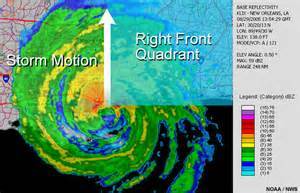 Most of the tornadoes form in the right-front quadrant of the storm, the region where the wind shear allows low-level winds to develop a horizontal rotation. Wind shear, you may remember, is how wind speed and direction changes with height. While winds up at 3000 feet are blowing strong and from the southeast, friction from the land surface can cause the surface winds to be weaker and from the northeast. This horizontal rotation, caught in the strong updrafts of a thunderstorm, can be tilted vertically and form a tornado. But tornadoes are not just limited to this area of the storm. They’ve been observed in all quadrants, but they are usually found east of the eye where winds are stronger. They are usually on the weaker side (EF-2 or lower) but have been recorded up to EF-4. (Carla, 1961) The added danger of these tornadoes is at they form rapidly and warning time is short. So, sharks or no, stay inside if you’re in a hurricane… or better yet, evacuate. There you have it, an excuse to talk about Sharknado wrapped in a new post. Let me know if you have any questions and follow me on Twitter. Oh, and a sequel has been green-lit already!